Plenty of Thurston County farmers offer u-pick options throughout the berry picking season. Why do U-pick? When I asked my friends for their perspective, I expected to hear about the practicalities–the break in price point, for instance, or the quality control benefits of personally hand-selecting each berry. One of the benefits of visiting a U-pick farm? You can taste the berries as you go. Some additional advice: it’s always best to call ahead or check the website to see if the crops are ready for picking. Unless otherwise noted, assume that you should pay with cash. Finally, if you’re looking for a farm outside the Olympia area, check out pickyourown.org; they offer a detailed list of the nation’s U-pick farms, organized by state and county. Without further ado, here are seven Olympia area U-pick farms. 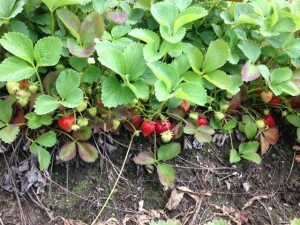 Strawberries are generally available in June and July, although weather and demand affect the season. U-pick raspberries tend to be available in July and August. 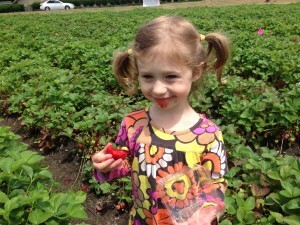 Spooner Berry Farms (3327 Yelm Highway, Olympia) opens daily from 8am to 6pm for strawberry picking. The 2014 price for U-pick is $1.65 per pound. Portable toilets are available for pickers. A tractor pulls the Berry Express from the U-pick pay station to the U-pick plants. 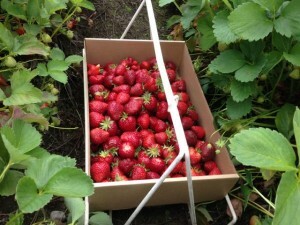 The farm provides wire baskets lined with cardboard cartons for picking; you take the berries home in the carton. Pay by cash, check, or card. Phone: 360-456-4554. 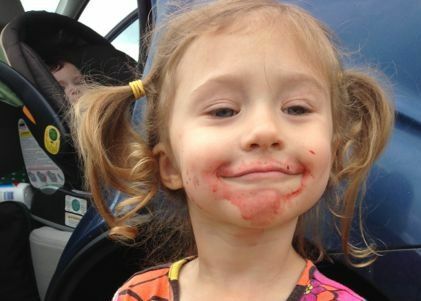 Pigman’s Organic Produce (10633 Steilacoom Road SE, Olympia) offers U-pick for both strawberries and raspberries. As the name suggests, they are certified organic. Generally, they are open for picking Monday through Wednesday, 10am to 5pm and can also open by appointment. U-pick strawberry prices for 2014 are $2.75 per pint, $14 for 6 pints (a half-flat), and $27 for 12 pints (a flat). Phone: 360-491-3276. Email: PigmansProduce@gmail.com. Depending on weather and the specific berry varieties grown on a farm, blueberries can be available as soon as mid-July and as late as early September. The Black Lake Blueberry Farm (3105 – 54th Ave SW, Olympia) doesn’t use any pesticides on their crops. Restrooms are available for pickers. Bring your own containers to take home the berries. Please note that the fields are closed on rainy days. Pay by cash or check. Phone: 360-480-2452 (no calls after 8pm, please). 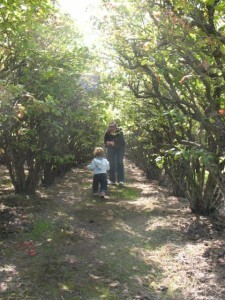 Carr’s Blueberry Farm (3844 – 1/2 Gull Harbor Road NE, Olympia) is certified organic for all crops grown on the premises. The 2013 U-pick blueberry price was $2.25 a pound. Pre-picked berries are also available. Bring your own containers to take home the berries. Open seven days a week, dawn to dusk. Pay by cash or check. Phone: 360-352-3622. Friendly Grove Blueberries, formerly known as Dan and Crown Blueberry Lane, (3102 Friendly Grove Road NE, Olympia) grows organic blueberries. The 2013 U-pick price was $2 a pound for most of the season, but at the end of the season they sold for $1 a pound. These farmers loan sunhats to pickers. Phone: 360-357-3837. Gile Blueberry Farm (3641 Gull Harbor Road NE, Olympia) is open daily from 9:00am to 8:00pm. They have containers for picking and, if necessary, boxes for you to take home your berries. Pickyourown.org lists their 2014 per pound prices as $1.50 for U-pick and $2.25 for pre-picked. Phone: 360-352-4847. Teddies Berries (6344 – 123rd Ave SW, Olympia) minimizes use of pesticides and other chemicals. Bring your own containers to take home the berries. 2013 pricing was $1.30 a pound for U-pick, with $1 “retro pricing” at the end of the season. Pay by cash or check. Phone: 360-357-8370. Email: teddiesberries@comcast.net.